Apple plans to raise Apple Music pricing in Hong Kong at the end of February, charging individual plan subscribers an additional $10 Hong Kong dollars per month to access the streaming service. 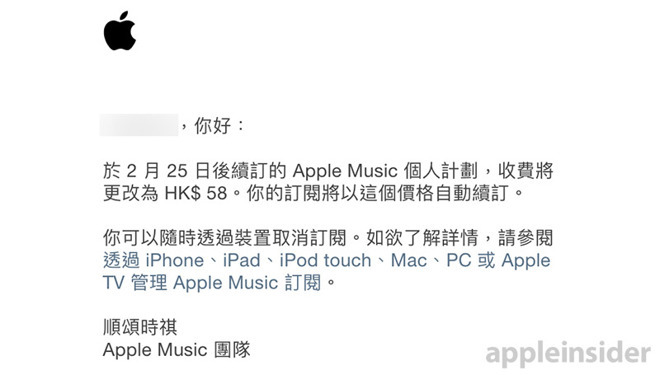 Apple notified existing customers, like AppleInsider reader Allan, of the upcoming adjustment via email on Friday, saying individual Apple Music plan pricing will rise to HK$58 on Feb. 25, up from the HK$48 currently advertised on the company's website. Separate emails sent to readers Sam and Enis shows Family and Student plan pricing will increase from HK$78 and HK$25 to HK$88 and HK$28, respectively. The company is giving users fair warning to cancel their subscription before the increase is set to take effect, as existing accounts will automatically renew at the higher price. Whether Student plan pricing is also impacted by the fee hike is unknown, but previous increases to the streaming service have seen prices for all tiers rise simultaneously. Apple failed to offer details explaining the change, but the company routinely adjusts the prices of its consumer services to reflect broader shifts in the economic landscape. For example, the company just this week adjusted App Store pricing in a handful of countries to account for changes in regional VAT policies. While mere speculation, the Hong Kong Apple Music subscription increase could be in response to unfavorable exchange rates, new tax legislation or changes in contracts with music labels. Apple's most recent Apple Music adjustment came in December, when the company dropped subscription rates in Brazil after switching iTunes pricing there from U.S. dollars to the Brazilian real. Update: Information about new Family plan pricing added.